"Clones are not people. The outcomes of our elections must recognize this truth." 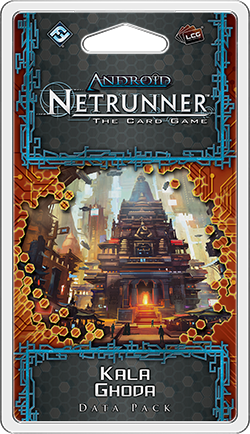 Fantasy Flight Games is proud to announce the upcoming release of Kala Ghoda, the first Data Pack in the Mumbad Cycle for Android: Netrunner! 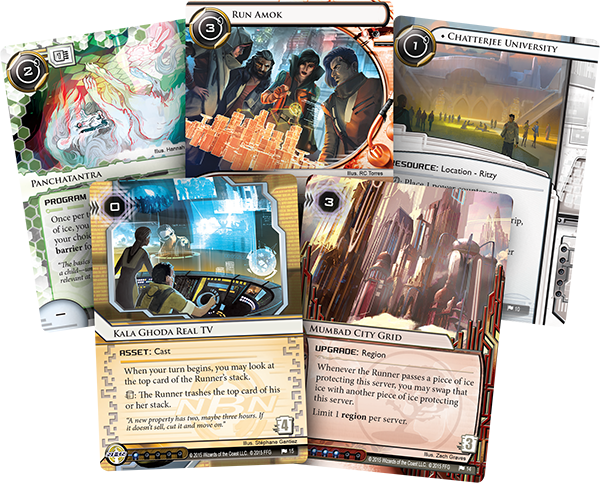 In the future of Android: Netrunner, the Indian Union is the planet's most populous democracy and generally a hopeful, dynamic place. Its largest megapolis, Mumbad, is home to many of the world's greatest technological advancements, and while there remain vast gulfs between the nation's richest individuals and its poorest, they are no longer separated by the specter of the caste system. In theory, the scheduled castes are relics of history, but daily life acknowledges two: human and android. Now, as elections draw near, one question consumes the I.U. and defines its most heated debates: should clones be granted full citizenship? Kala Ghoda introduces sixty new cards (including a complete playset of nineteen different cards) that explore this question and the political turmoil it raises, even as it transports the game's Corps and Runners to the massive, sprawling megapolis of Mumbad, which stretches from Mumbai in the south to Ahmedabad in the north. Here, the heated political environment leads to new opportunities for all seven of the game's factions, and Jinteki will stop at nothing to make sure their most lucrative product remains just that: a product. New Cycle. New Locale. New Tech. As the first Data Pack in the Mumbad Cycle, Kala Ghoda does more than introduce sixty new cards; it also introduces us to the cycle's new themes and mechanics. It begins by transporting the game to the Indian Union and the Mumbad metroplex. Much as the SanSan Cycle explored the life and cybercrime of the SanSan megapolis, the Mumbad Cycle explores the structures, cultures, and local color of the Indian Union's technological nerve center. Kala Ghoda, specifically, is the art district in south Mumbad that is famous for housing both the historical museum and Chatterjee University (Kala Ghoda, 10), where legions of the IU's top software engineers receive their higher educations. Meanwhile, the new mechanics from Kala Ghoda and the Mumbad Cycle include alliance cards for the Corp and consumer-grade hardware for the Runner. Both of these alter the very rules of deck composition and encourage the exploration of new deck types. 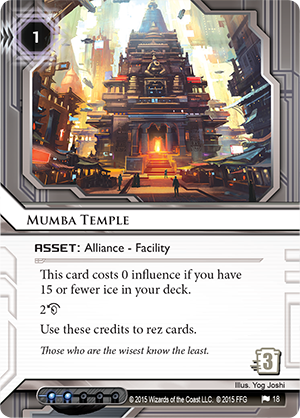 Like Mumba Temple (Kala Ghoda, 18), each alliance card introduces a specific deck-building requirement that, if you meet it, negates its influence cost. 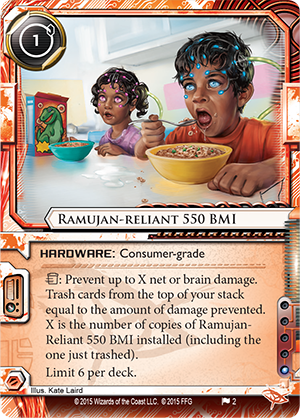 On the other hand, Consumer-grade hardware, like Ramujan-reliant 550 BMI (Kala Ghoda, 2), explodes the "limit of three" for deck-building. Along with new signature events for each of the game's three Runner factions, these consumer-grade cards all come with the text "Limit 6 per deck," overriding the standard rules for deck construction and introducing effects that become increasingly powerful for each copy that you play. Throughout the cycle, you'll also find new contacts, new agendas, new region upgrades, and new identities for each of the game's seven factions. You'll see underhanded political maneuvering, elite sensie artists, programs inspired by Hindu mythology, and bleeding-edge agricultural initiatives. Cultural influences, philosophical debates, enduring traditions, and technological advances all race toward the future in the Mumbad Cycle, but one thing trumps them all… the race for the region's most valuable data! 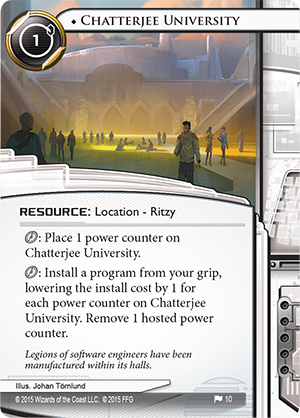 Mumbad is the most populous city in the Indian Union, and it offers a new stage for Android: Netrunner, complete with new faces and new dangers. The question of whether or not clones should be granted citizenship has divided the nation, and the advocates who argue that clones are people are being countered at every turn by Jinteki, who has applied the full extent of its lobbying might toward the issue. Following on the heels of the SanSan Cycle, we wanted to create another cycle that evoked a sense of place. We’d been to the Moon, but we hadn’t yet traveled the planet far from New Angeles. With its booming export industry and teeming population, Mumbad is the perfect place for the continued exploration of futuristic cybercrime. In Mumbad, it's easy for a runner to disappear into the crowds or for a Corp to offload production. Meanwhile, there are significant differences between Mumbad and the megacorp-controlled regions in and near New Angeles. In Mumbad, local organizations and corps still hold more sway. This means the game's four megacorporations must forge strategic alliances, which affects the way they do business. Runners will also find that new options are opened up to them, with the relaxed restrictions on technology allowing them to double-down on important cards. Even though the Mumbad Cycle explores a lot of new ground, it does so with very little rules overhead. We are still committed to keeping the game as clean and simple as possible, spurring its evolution without relying on new mechanics. This helps keep the barrier of entry low, and new players who dive straight into Mumbad after their Core Sets should find the concepts familiar, even when playing against the most grizzled veteran. For all its new cards, the Mumbad Cycle is classic cybercrime at its best, and we hope you have fun exploring all the new deckbuilding options that it opens up! The Indian Union's upcoming national elections and the hot-button issue of clone rights have created massive political turmoil, and that means opportunity. Which players will be the fastest to take advantage of the chaos? Which will do so best? All of the game's megacorps have moved to place their bets and protect their investments, and there are signs that the region's runners may be coordinating their efforts in a wholly unprecedented fashion. Is it true what they say? Could this be the start of an all new Shadow War? 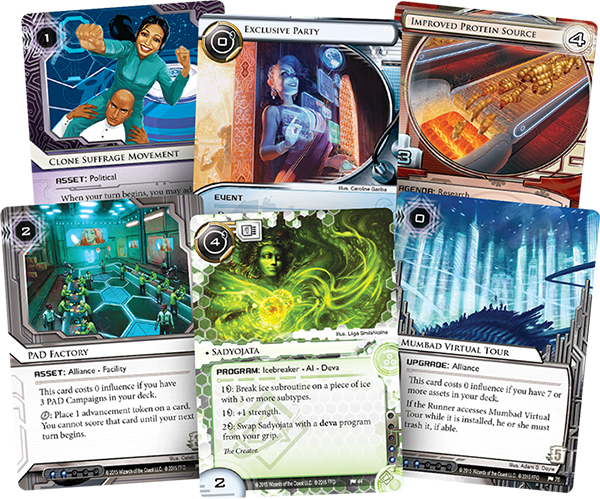 The Corps and Runners of Android: Netrunner battle for the hearts and minds of a nation in the Mumbad Cycle, and that means a battle for the control of all relevant data. Jack in, and play your part in the ongoing struggles when Kala Ghoda arrives in the fourth quarter of 2015!